Running from room to room, I searched for a source. An infant’s frantic sobs drove me to throw open each door along the endless hallway, only to find dust and cobwebs, and furniture draped in white sheets. The wood floor creaked, the sound mixing with the wails that were near, but then distant. The final tall wooden door called to me. Sweat ran down my forehead blurring my vision and a rotten stench caught in the back of my throat. The brass doorknob was cold. It took both my hands to get it to twist. The door finally creaked open. Tall windows bowed out in a semi-circle and rain pummeled against the glass. The frantic sobs came from a white crib shrouded in shear fabric in the center of the room. Inching forward, fear snatched my breath. The crib shook with the wails of the child I couldn’t yet see. I pulled back the shear fabric with a shaky hand. The baby’s bonnet-covered head was just a skull, empty eye sockets stared ahead, its open mouth ready to let out another wail. Skeleton arms stretched toward me. I’m not sure if I screamed aloud or just woke from the fright of the recurring nightmare. They’d been coming more frequently. I’m not sure which was worse, this one of searching for the crying baby, or the other of walking through the cemetery to find ghosts of babies wailing behind each tombstone. I had to do something and soon. The guilt of what we’d done was eating me up. It was just four a.m. and too early for rising on a Saturday morning, but there was no going back to sleep. I would not rest another night without correcting this wrong. Within an hour, I was on my way. The small statue of the shepherd wrapped in a blanket in the trunk. I could have disposed of it years ago, yet I hung onto it from guilt. Maybe I’d always known one day I’d make this trip of shame. The gates to the cemetery were still locked for the night, the sun not yet up. But I knew exactly where I needed to go, and it wasn’t far beyond the marble pillars framing the iron gates. That’s what had made it easy the night I took the dare and stole the statue. The raised garden in the middle of what they called the “Babyland Garden” was easy to access, even when the gates were closed from dusk to dawn. I thought it was cool, kind of funny, that night years before. Now, the stupidity of it all made me shudder. Stopping next to one of the pillars, I popped the trunk and pulled the statue into my arms. Making my way around the gates and through the small grove of trees I prayed to not get caught. When I got to the raised garden, I doubted my mission for the first time that morning. The statue had been replaced with a small marble angel. I hadn’t been back inside those gates since that night and had assumed the shepherd’s platform would still be empty. “I’m such a dumbass,” I muttered. There was no telling what the replacement statue had cost. There was no choice but to leave my guilt-ridden token there with its stand-in. I lowered the missing shepherd boy to the rock edge of the raised garden and walked away. I could only hope my nightmares would now be over. Most of the preceding story is my imagination. There was a statue of a small shepherd boy with a tiny lamb at his feet stolen years ago from the cemetery my parents owned. My brother and I found it returned one morning some five or six years later. It stood next to the angel statue that we’d bought to take its place. I’m not sure if it was simply guilt or guilt-ridden nightmares that drove the thief to return the statue so many years after we noticed it missing, but I’d like to think that those who commit such crimes against the dead are tortured for their sins. Is there anything you feel guilty about that may be invading your dreams? What sort of nightmares do you have? 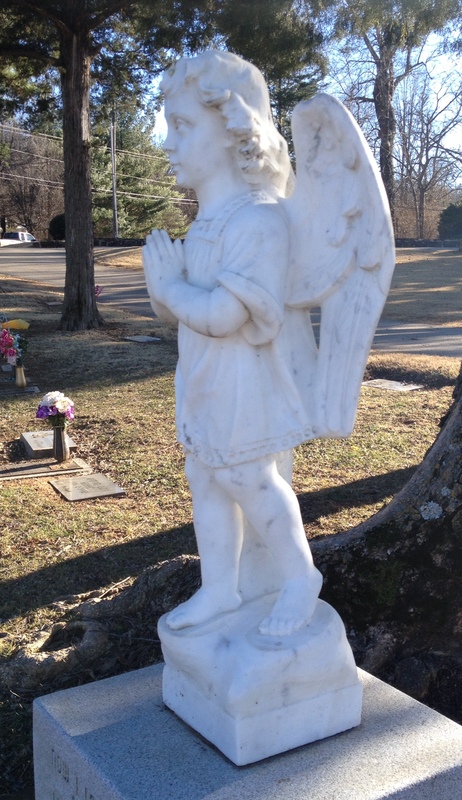 This entry was posted in Mystery/Thriller Writing and tagged angel, baby ghosts, Cemetery, cemetery gates, cemetery theft, guilt from theft, nightmares, shepherd boy, theft by Lori Ericson. Bookmark the permalink.